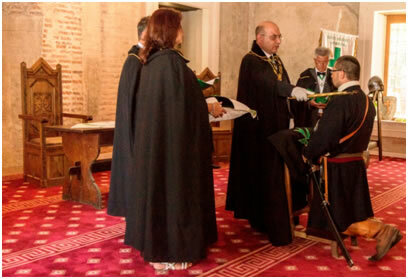 On Saturday June 13th, the Grand Priory of Hungary joined forces with the Grand Priory of Montenegro so as to conduct a joint investiture service. 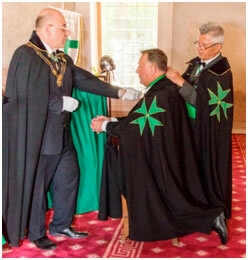 The investiture was held in the Southern part of Hungary, contrary to the custom of the Hungarian Grand Priory's choice of venues in Budapest or in the surrounding areas. The choice of venue was indeed essential so as to ease logistical preparations from the visiting deputation of the Grand Priory of Montenegro, led by its Grand Prior, and also due to the fact that a delegation from the nearby and newly established Grand Priory of Serbia was also present. Furthermore, the venue of Szigetvar, with its majestic medeival castle used for the same investiture, is also the main area of activities of the Hungarian Commandery of Szent Erszebet, which joined our Order from the Military Lazarite limited liability company last year. It was indeed a wonderful investiture, in the county of Baranya. The town's fortress, used by the Grand Priory of Hungary for the investiture, was the setting of the Battle of Szigetvar in 1566. It was a sanjak centre at first in Budin Province (1566-1601), later in Kanije Province (1601-1689). There was already a fortress in the marshland back in Celtic and Roman times. The Castle of today was built on an artificial island - created by filling up the swampy area and driving the stream into a canal - in the 15th century. If you walk along the top of its external walls, 4 m thick at some places, you can get great views of the town. The bridge over the inner moat stands at the place where Nikola Subic Zrinski and his soldiers broke out of the inner castle. The equestrian statue of Zrinski (*Zrin in modern Croatia, around 1508. - Szigetvar, 7. September 1566.) commemorates the self-sacrifice of the heroic captain of the castle. It is said that the Turks built the mosque of sultan Suleiman I and the minaret beside it - only part of the latter can be seen today - in the honour of their sultan who died after the castle was conquered. In 1966, on the 400th anniversary of the siege, Szigetvar regained its old rank of a chartered ancient city. Development began to gather speed. Today it has a population of 12,000. 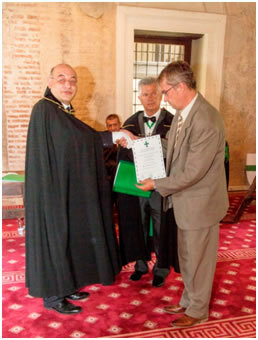 In October 2011, the city received the title Civitas Invicta from the Hungarian Parliament. In 1994, the Hungarian-Turkish Friendship Park (Hungarian: Magyar-Torok Baratsag Park) was established as a public park, dedicated in memorial to the Battle of Szigetvar. 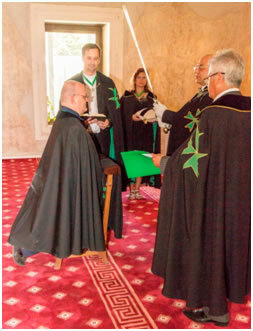 The investiture was led by the Order's Grand Chancellor, Chev. Max J Ellul and his aide de camp, Chev. Stefan Andras. The Grand Priors of Hungary, Montenegro and Serbia, the Chevaliers Lajos Vigh, Dragan Nikolic and Dragan Milic were also in attendance, as was the Commander of the Commandery of Szent Erszebet, Confrere Levente Toth, the latter being promoted to a Knight of Grace of the Order during the investiture ceremony. Deputations from the Grand Priory of Italy and the Hungarian National Federation of the Blind and Partially Visually Impaired were also present. 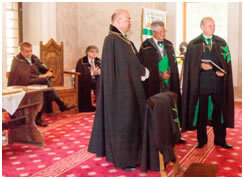 Ten postulants joined the Order during this solemn investiture, including the Mayor of Szigetvar. The latter announced the joint vision of the city and the Order in the South of Hungary to further develop the grounds of Baratsak Park so as to be able to offer a hub for the vulnerable, serviced on a voluntary basis by the members of the Order and their volunteers. The investiture luncheon was held in a quaint restaurant just across the city, on the other side of the fortress. Traditional Hungarian food, washed down by the best Hungarian wine (endemic to this particular Hungarian region) was the Order of the day, together with traditional Hungarian and international music overseen by the Grand Prior of Hungary.